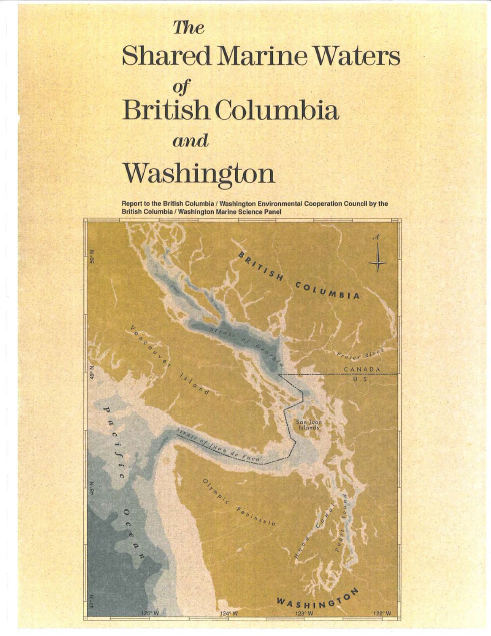 The British Columbia/Washington Marine Science Panel was created in 1993 under the 1992 Environmental Cooperation Agreement between British Columbia and Washington state. The panel was asked to evaluate the condition of the marine environment in the Strait of Georgia, Strait of Juan de Fuca and Puget Sound region on both sides of the international boundary. For purposes of this report, this region is called the shared waters, and the area in the immediate vicinity of the international boundary is called the transboundary waters. The panel reports to the British Columbia/Washington Environmental Cooperation Council, which was formed as part of the Environmental Cooperation Agreement and which identified water quality on both sides of the boundary as a high-priority issue requiring immediate and joint attention. To guide its inquiries, the panel addressed several questions about natural processes, resource populations, contamination and future trends in the area. In early 1994, the panel participated (with a Work Group supporting the Environmental Cooperation Council) in a scientific symposium featuring invited presentations by Canadian and U.S. scientific experts on a broad range of topics. The scientific review papers from this symposium have been published as a separate technical volume and form an important basis for this report. The panel based its recommendations about conditions in the shared waters and proposed remedial actions on scientific evaluation of actual harm done and on the risks that harm will be done, rather than on popular perceptions or political considerations. Where insufficient information is available to evaluate harm and risks, a precautionary approach and additional research are recommended.